Ever since the new update came out on iPad for the Google Drive App, it has been difficult for students and teachers to figure out how to effectively logout of the Google Drive App. This has particularly become an issue for schools who currently are not operating on a 1:1 Program. Since students in these schools must consistently share devices such as laptops and iPads, they need to frequently sign in and sign out of their accounts, every time they use a device. In order to overcome this problem, I have created a couple of resources to help support students and teachers when trying to logout of the Google Drive App on iPad. Below is a Google Slideshow of screenshots to demonstrate the steps that are needed to successfully logout or "Remove" accounts from the Google Drive App. 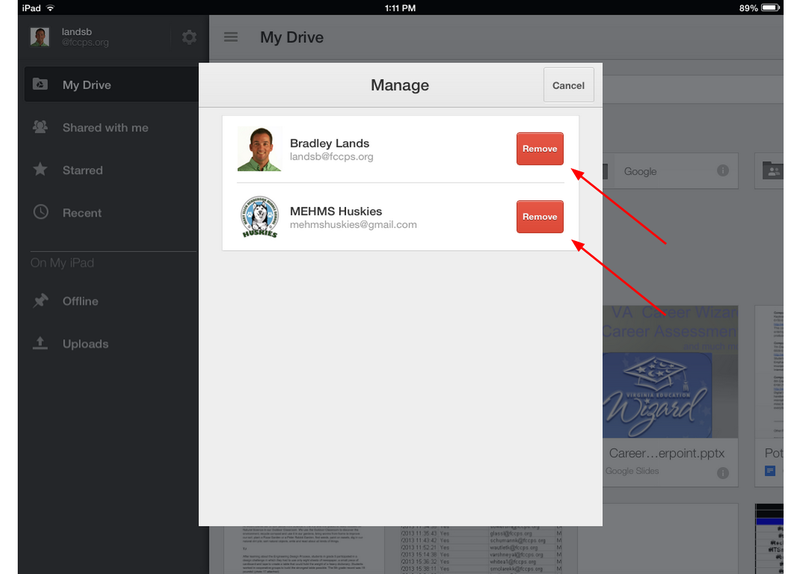 In addition, I have also created a short video tutorial to serve as a screencast demonstration on how to successfully remove student accounts from the Google Drive App on iPad. Note: This process is only needed on iPads that are operating on the latest version of Google Drive. If the Google Drive icon has a "white" background, then it should be the latest version. If the Google Drive icon has a "black" background, then these directions probably do not apply to you yet. In order to update to the latest version of the Google Drive app, visit the App Store on your iPad.